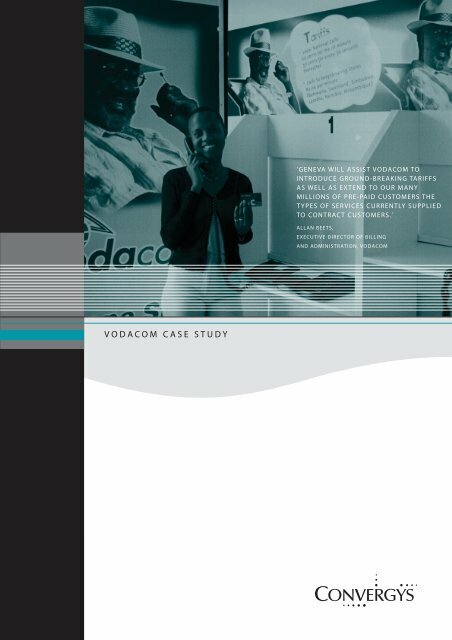 VODACOM CASE STUDY Vodacom, South Africa’s largest mobile operator, is using Geneva to support all of its new service offerings to both pre- and post-paid customers. These new services include GPRS-, SMS- as well as content-based services. South Africa, the prize for the top emerging brand in the Sunday Times Brands of the Year awards in both 1999 and 2000 and the Professional Management Review (PMR) Golden Arrow award for the Best Cellular Network. IT STRATEGY AS A ROUTE TO INCREASED ARPU Vodacom is more optimistic than its competitors about growth prospects in the mobile market. It is predicting 19 million users by 2007, compared with around 10 million now, and it plans to target this new market aggressively. Its aim is not merely to increase the size of its subscriber base but also to increase ARPU by offering customers a range of innovative new services. This strategy requires a modern flexible billing platform. COMPANY BACKGROUND Vodacom, which has its headquarters in Midrand, has over 7 million subscribers and is the largest of the three mobile operators in South Africa, with about 60% of the market. It currently handles 30% of the country’s telephony traffic and 10% of the entire African continent’s. It has more than 4000 base stations and covers about 64% of the total land surface of South Africa. In terms of licence conditions negotiated between Vodacom and South Africa's regulatory authorities, Vodacom undertook to roll-out 22,000 public access GSM telephones in South Africa's under-serviced areas. These are not standard mobile telephones but they resemble fixed line telephones and are installed in shipping containers, shops and other areas frequented by the public. Although initially a licence obligation, Vodacom continues to roll-out Vodacom Community Services telephones with enthusiasm as these public phones have made a tremendous difference to the lives of ordinary South Africans. Vodacom’s shareholders are Telkom SA (which owns 50% of the company), Vodafone, Venfin and HCI. Vodacom has won a number of prestigious awards. These include induction as a Gold Member of the GSM Association for the role played in making mobile communications widely available across CONVERGENT PRE-PAY Since the ratio of prepaid to postpaid subscribers is currently around 6:1, ARPU will only be significantly increased if prepaid customers have the same access to new services as postpaid customers. Traditional network-based prepaid solutions were not designed to deliver advanced data and content services, especially when these are priced using complex tariffs and discounts. Integration between the Intelligent Network and the rating platform is necessary in order to deliver a solution that allows prepaid and postpaid customers to enjoy the same level of tariffs, discounts and marketing offers. Vodacom has been pioneering the introduction of an IT solution that supports this vision of Convergent Pre-Pay. CONTENT SERVICES The concept of content services is still very much in its infancy, although operators in many different countries are offering services such as ring tones and screen savers, as well as location-based services like information about local tourist attractions. The potential range of services is huge and no one yet knows how this market will develop or what in the future will catch the mood of mobile phone users. Vodacom’s strategy is therefore to make its network available to a wide range of content providers who will have the freedom to develop new services, ranging from the practical to the fashionable, in return for a share of their revenue. As part of the deal, Vodacom will also handle revenue collection and distribution on behalf of the third parties involved. To implement this strategy requires a billing platform that supports functionality to handle merchant settlement. IMPLEMENTATION AND MIGRATION STRATEGY Vodacom’s IT environment, used to support voice traffic on its GSM network, includes Verizon mediation, a billing system called BATS, and iCAP subscriber administration system, all running on Compaq hardware. In order to launch its 2.5G network, as well as to be able to charge for new types of event such as SMS content in appropriate ways, rather than just as a flat rate per message, Vodacom needed a new rating platform that was able to handle data and content events. ‘Geneva impressed us as a product because of its versatility and its ability to bill for any service without requiring changes to the code.’ Allan Beets, Executive Director of Billing and Administration, Vodacom Geneva was also selected because it would allow new services to be introduced with minimal delay. Its extreme flexibility means that its rating engine can be harnessed to enhance Vodacom’s existing billing engine, offering a smooth migration path for Geneva’s use to be extended within the billing environment. Vodacom had an aggressive timetable for the implementation of Geneva, which went into live operation within three months of the start of the project. CONTENT SERVICES Geneva will be integrated with Siemens’ IN platform in order to deliver Convergent Pre-Pay involving content services. The system is configured so that the IN handles call set-up, rates and maintains the balance in the case of pre-pay customers, whereas rating for post-paid customers is handled by Geneva.  Geneva handles merchant settlement; the same event that is used to bill the end customer is also used to update the content provider’s account. ‘Vodacom is at the forefront of developments in the South African mobile market. The company is planning to introduce some extremely innovative new services which will make use of Geneva's advanced capabilities in handling billing for content as well as its ability to bill on behalf of third parties and to settle with multiple parties. We are delighted that such a significant mobile operator in South Africa has given us this vote of confidence in Convergys and its Geneva software.’ Stephen Newton, President of Convergys EMEA. Vodacom is already offering a range of popular SMSbased services that includes weather reports, racing tips, horoscopes, gambling and information about local entertainment. Within a few months of launch, they were processing around 1m. events a month. SUMMARY As 2.5G services come on-stream, there will be room for only a small number of telecommunications companies at the heart of the mobile commerce revolution. In order to achieve this pivotal position, operators will need to provide a safe and secure environment for customers and content providers, and make available a wide range of attractive and innovative services in association with a strong brand image. Vodacom’s strategy means that it is well positioned to dominate the mobile marketplace in South Africa.